There are a good number of textile books out there that cover Laos and Southeast Asia. I will be covering a few other noteworthy ones. However I wanted to start off with this one. I came across this book and was just hit by the enormity of the information. Not only is it a large sized book, it also has over 400 pages of black and white text and images. Though I wish the images had been in color. It's an impressive compendium of Lao textiles. It really does cover the entire range of textiles created in Laos. For example, pa biang (ceremonial scarf worn by men), pa chet, pa seen, pha chong kaben, tung (flag), ceremonial textiles, pa hom (blanket), curtains (for ceremonies, bed, and door), miscellaneous (maun, pa koma), individual artistic elements (ex. nak/naga, birds, plants, ceremonial objects, Buddha images, geometric forms, water elements, hooks, etc.). Essentially it gives you the background on the style and design accompanied by pictures. I highly recommend it if you're interested in this area of study or if you simply have a high appreciation for Lao textiles. Sidenote: A little fun fact. 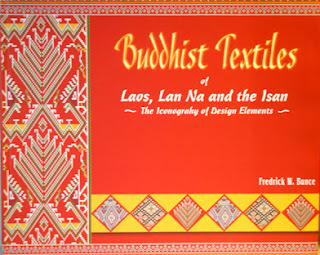 This is one of the few Lao textile books written by a male (Frederick). Other books on this same topic have typically been female authors.